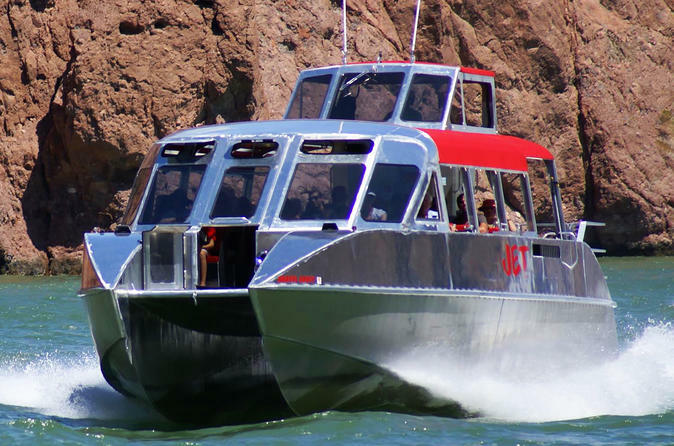 This fun tour takes you Jetboating 58 exciting miles down the Colorado River to Lake Havasu. Once there, enjoy a picnic lunch on the beach, take a stroll on London Bridge - which was reassembled at Lake Havasu, Arizona. Make a stop in Oatman Ghost Town which is an old west gold mining town with real old saloons and shops! This scenic tour starts with a beautiful drive from Las Vegas through the high desert and Joshua Tree Forest to Laughlin, Nevada and the Colorado River, where you will board a powerful 1200 HP Jet Boat for an incredibly fun 58 mile ride down the Colorado River, through the beautiful Topock Gorge to :Lake Havasu. There are no whitewater rapids to worry about on this tour! Enjoy a 2.5-hour stay and a picnic lunch on the sandy shores of Lake Havasu Beach, the "Ft. Lauderdale of the Mohave Desert"! Be sure to bring your swim suit and towel and go for a refreshing swim in this beautiful freshwater lake - all virtually next to the iconic “London Bridge". This amazing structure was dismantled, shipped to America and reconstructed at Lake Havasu, Arizona. Walk the bridge that has been graced by both Kings and Queens. On your return to Las Vegas, enjoy a stunning drive on the famous Route 66 where there will be a stop at Oatman Ghost Town, the Old West gold mining town from the 1800’s that wouldn’t die. You’ll love the Wild Burros on the main street. This is a great conclusion to a wonderful, exciting and memorable day!